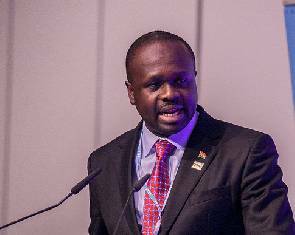 Communication Minister, Dr Edward Omane Boamah, has dared Minority Leader, Osei Kyei-Mensa-Bonsu, to prove with facts that a $98 million rural electrification contract allegedly being fronted by Mrs Selassie Ibrahim, for a Chinese firm, is fraught with malfeasance by mere dint of Mrs Ibrahim’s affiliation to the deal, for which reason the Minority in Parliament wants the contract halted. “I will strongly suggest that if the honourable Member of Parliament has strong evidence of any impropriety, I will urge him to put it out,” Dr Omane Boamah dared in an interview on Joy FM’s special edition of the Super Morning Show, which was hosted by Kojo Oppong Nkrumah on Monday December 29, 2015. Mr Osei Kyei-Mensa-Bonsu had told Accra 100.5fm in an interview on Thursday December 24 that any company or firm associated with Mrs Ibrahim, the embattled CEO of Smarttys Management Limited – the private firm that is currently embroiled in a GHS3.6 million bus branding scandal – must not be considered for the rural electrification contract, as well as any other contract, until she has been investigated for the GHS3.6 million bus branding scandal. Chief of Staff, Julius Debrah, ordered Smarttys, to refund GHS1.9 million to the state, in connection with the branding scandal. The refund directive followed a review of the contract by the Attorney General, on the orders of Mr Debrah, after the Minority in Parliament, led by Mr Kyei-Mensah-Bonsu, raised red flags about the cost for the embossment of the portraits of three former presidents of the fourth republic, as well as that of the current President, on 116 intra-city Metro Mass Transit buses which are meant for Bus Rapid Transit (BRT) purposes. Minister of Transport, Dzifa Attivor, voluntarily resigned over the scandal. Mr Kyei-Mensa-Bonsu believes it will be inappropriate for the state to ink the $98 million contract with the Chinese firm because of Mrs Ibrahim's involvement. The Suame MP also wants a freeze on all contracts existing between the Government of Ghana and Smarttys until investigations into the bus branding scandal are over and done with. "Why let out sheep to pasture when the earlier flock has still not returned from grazing?" he asked. 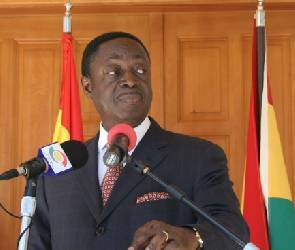 The MP also wondered whether the order to Smarttys to refund the GHS 1.9 million would be the end of the matter. "So, as she has been asked to refund the money, would Selassie be prosecuted, or she walks free once she settles that amount?" wondered the Minority Leader. "We must ensure that she is prosecuted because she obtained the payment by wrongful means. "Also, we are told that the money paid to Smarttys came from our oil revenue. So, who withdrew money from the national coffers for Selassie? That person must also face the music," Mr Kyei-Mensa-Bonsu added.